immy Barkan is a master yoga teacher certified by Ghosh’s College of India, Calcutta, India in 1981. He is considered to be one of the pioneers of yoga in the United States, practicing long before yoga became popular and mainstream. Jimmy began his yoga career under the guidance and wisdom of Bikram Choudhury and was honored when he became known as Bikram’s Most Senior Teacher, an accomplishment very few have since obtained. Jimmy’s first yoga studio opened in Fort Lauderdale, Florida in January 1983, Plantation, Florida in 2001 and Boca Raton Florida in 2012. 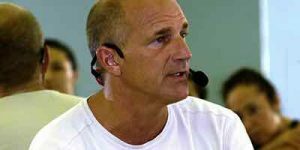 Since the establishment of The Barkan Method of Hot Yoga in 2002, Jimmy’s Level I Teacher Training programs are held in Fort Lauderdale, Fl., North Carolina, Westchester, Long Island, New Jersey, Iceland, The United Kingdom, Japan, Hungary and Australia. There are national and international studios and teachers practicing The Barkan Method Hot Yoga including; Canada, Japan, Australia, New Zealand, Iceland, Denmark, Norway, Sweden, Finland, France, Germany, Austria, Hungary, South America, Thailand, South Africa, Ireland, The United Kingdom and throughout the United States. Barkan also offers Level, II, and III Teacher Training programs throughout the year in Fort Lauderdale, Florida and Costa Rica. Jimmy has also trained many of our country’s top professional athletes throughout the years including members of the NFL, NBA, NHL, the 1997 World Series Champions Florida Marlins and PGA Tour players. With a Bachelors Degree in Fine Arts, (Dramatic Literature), from New York University, Barkan uses his education as a foundation for helping his teachers find their own voice and personal expression. Jimmy spent years studying the most effective ways to communicate as a leader and yoga teacher. Jimmy’s rare insight and intuition helps teachers to rid themselves of nervousness and self consciousness, guiding them to discover their own VOICE and potential as communicators both on the mat and off. Teachers will have a sense of confidence and accomplishment upon completing his training and Jimmy’s unique background creates an experience you will not find elsewhere. Barkan has been certifying Yoga Teachers since 1986. His extensive experience is what separates & distinguishes The Barkan Method Teacher Trainings! !